[PU LEATHER APPLE IPAD PRO 10.5" SMART COVER CASE] Slim, protective, and functional, the Apple iPad Pro 10.5" smart cover case is ideal to protect your device from unwanted scratches and blemishes with minimal bulk. [DOUBLES THE PROTECTION] The soft, flexible TPU disperses force from shock and impact throughout the case. The microfiber interior also protects your screen from unwanted scratches. The frosted back of the TPU cover help prevents unwanted scratches and fingerprints. [BATTERY SAVER] The auto sleep/wake function automatically wakes up the device when the flap is opened and puts the device to sleep when closed. This smart feature preserves the battery life of your Apple iPad Pro 10.5". [STAND FOR MEDIA VIEWING] The smart cover flap folds easily and converts into a kickstand, giving you the convenience to watch videos without having to hold the tablet. [PRECISE CRAFTSMANSHIP, DETAILED DESIGN] Precise cutouts and great tactile buttons. The case protects your device from unwanted scratches and blemishes with minimal bulk. The rubberized texture on the exterior is smooth and soft to the touch. Vena's vCover features a soft, flexible thermoplastic polyurethane (TPU) frosted back cover with an interior lining that doubles the protection compared to a regular polycarbonate (PC) case. The TPU corners disperse force from shock and impact through the case. The frosted back cover helps prevent unwanted scratches and fingerprints. With a soft microfiber interior, Vena vCover cushions your Apple iPad Pro 10.5" while protecting your screen from unwanted scratches. The Vena vCover comes with the sleep/wake function, which automatically wakes up the device when the flap is opened and puts the device to sleep when closed. This smart feature preserves the battery life of your Apple iPad Pro 10.5". The flap cover of the case folds easily and converts into a kickstand, giving you the convenience to view media on your Apple iPad Pro 10.5" without having to hold the tablet. 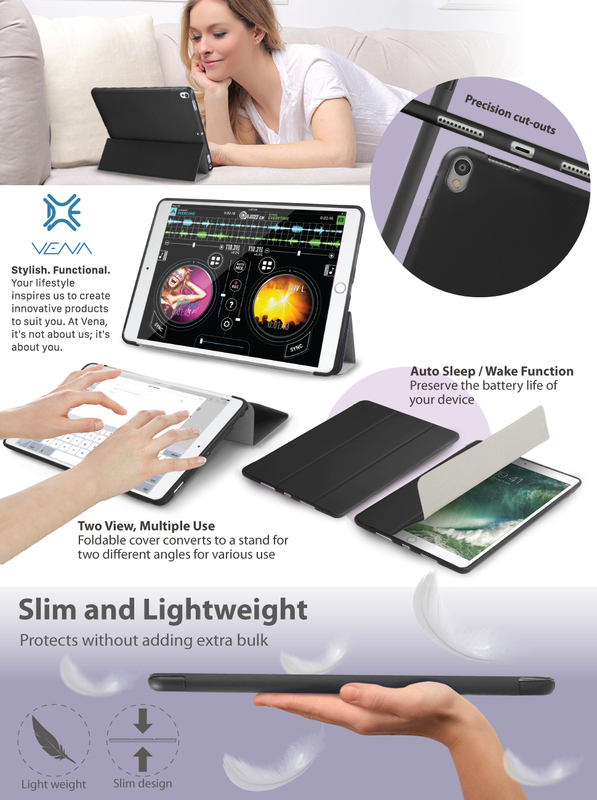 Vena vCover is designed with precision cut-outs to suit the Apple iPad Pro 10.5" and gives you effortless access to all ports, buttons, and features. • Apple iPad Pro 10.5"